Dollhouse miniature, Wicker cradle with woven hood, ornaments, high undercarriage and wheels, off-white, cotton and lace bedding, measures H 96 mm. x B 86 mm. x W 38 mm. 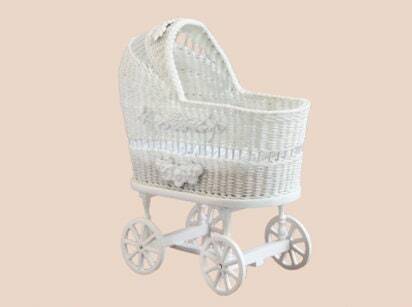 Great mini wicker basket will look perfect in the dollhouse kitchen! Wonderful mini oval wicker serving tray has a lovely platter on the bottom. As described and shipped fast! Adorable miniature wicker toy trolly for the dollhouse toys to be taken for a little ride! As described and shipped promptly! Wonderful mini wicker dog bed is far superior to an ordinary dog bed. Delighted with it!